Can you guess where I am? Let me give you some hints. 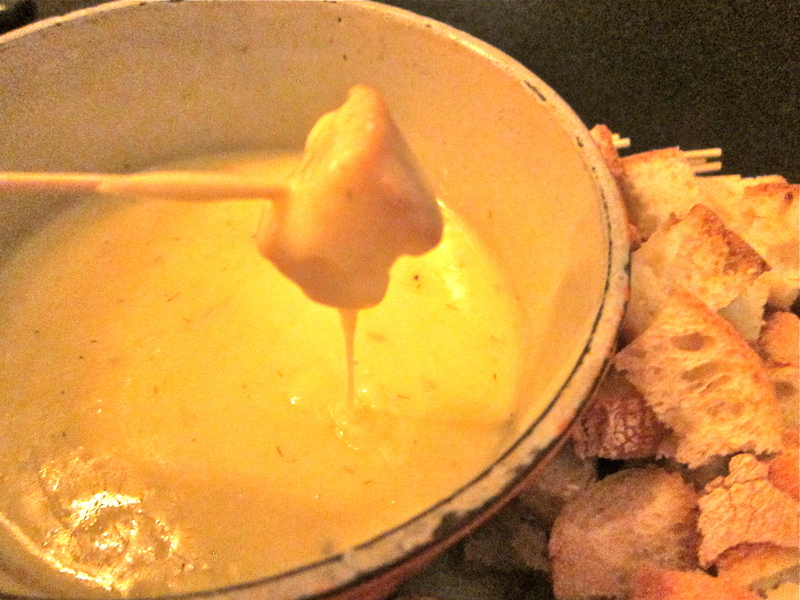 Cheese is the major product, with raclette and fondue the favorite dishes. People dress in embroidered folk costumes and yodel. If you hang around long enough, you could probably hear an alphorn and would certainly spot a Heidi playing among the half-timbered chalets. If you guessed Switzerland you are only half right. I am in “Little Switzerland,” the affectionate name given to New Glarus, a Swiss-settled community in Green County, Wisconsin. More specifically I am at the New Glarus Hotel Restaurant gorging on Swiss dishes and watching a fondue demonstration—but more about that later. New Glarus isn’t new. The town dates to 1845 when immigrants fleeing a famine started arriving from the canton of Glarus in Switzerland (the real deal) to settle the Wisconsin land that so resembled their native alpine farmland. The colony became an official village in 1901 and remains the major Swiss center of North America, welcoming Swiss immigrants, upholding Swiss traditions and celebrating Swiss heritage. 1. In 1905, the New Glarus area sported so many cheese factories (22 to be exact) that the village was called “the cheese Capital of the World.” Production has slowed; nevertheless Green County still claims to have the largest concentration of specialty cheese factories and award winning cheese makers in the United States. 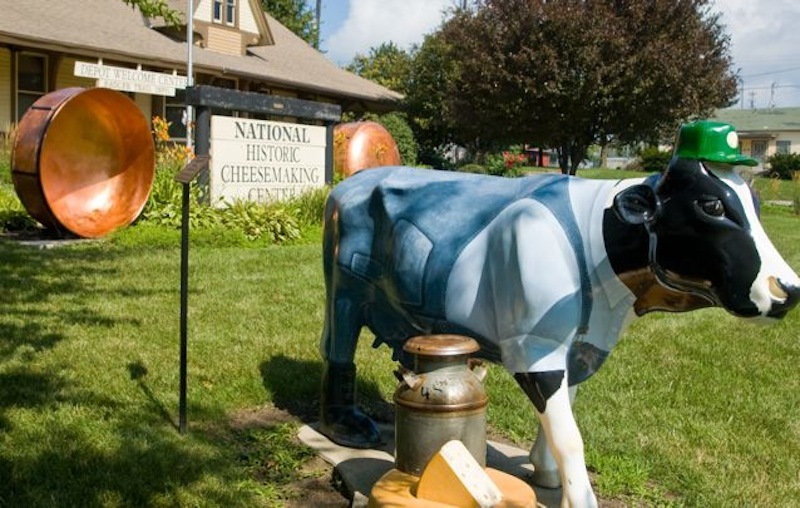 The County hosts the National Historic Cheesemaking Center and a plethora of shops selling cheese as well as restaurants serving cheese-based dishes. 2. The first woman to operate a brewery in the United States was/is Deborah Carey, who with her husband Dan, opened the New Glarus Brewing Company in 1993. The brewery rocks on today and is well worth a visit. was considered so important to the community that it was used as legal tender. 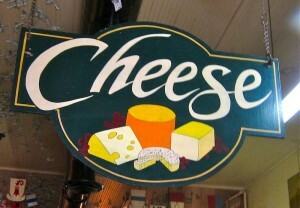 Today only one Limburger plant remains and that’s in Monroe, Wisconsin. The best place to try the cheese is also in Monroe at Baumgartner’s Cheese Store and Tavern, which opened in 1931 and is considered the oldest cheese store in Wisconsin. Baumgartner’s servers it’s Limburger sandwich on rye with raw onions. Talk about aroma…well, let’s not! I much prefer the scent of fondue, which brings us back to the New Glarus Hotel Restaurant. Built by Swiss immigrants in 1853 as a rooming house for travelers, the New Glarus Hotel Restaurant now functions primarily as a restaurant serving authentic Swiss dishes and sometimes staging Swiss-style concerts, dances and even cooking demonstrations for tourists who come by the busloads. 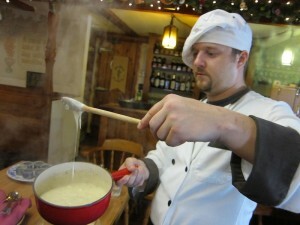 Chef Roland Furst making fondue. Put 1 cup wine in a heavy fondue pot. Set pot over high heat and bring wine to a gentle boil. Reduce heat so that wine simmers. Gradually stir cheese into wine. When the cheese melts and is smooth, stir in the lemon juice, garlic, dill, pepper and nutmeg. Combine cornstarch with remaining wine. Add to cheese and stir well. Let cook a minute or two, stirring constantly, until fondue is thick and smooth. Stir in the Kirsch. Serve immediately with bread chunks for dipping.